One day, maybe I'll write a cookbook that's just oatmeal recipes. I am a huge fan of oats for breakfast, especially if I can add protein to the mix. This recipe combines chocolate and peanut butter, which ended up tasting like a peanut butter cup with a thick pudding-like texture. Whisk the egg white, then stir into the oats, milk and cocoa powder. 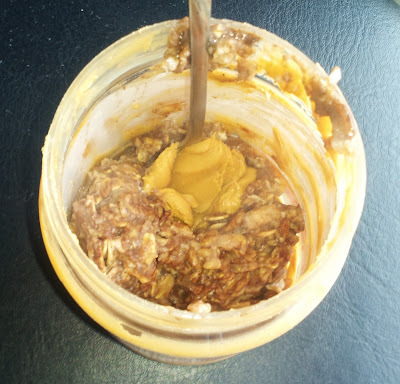 Microwave for 1 1/2 minutes, then top with peanut butter. Or, if you're lucky enough to have an empty peanut butter jar, allow to cool for a few seconds, then pour into the peanut butter jar to enjoy all the peanut butter goodness.